Late August through mid-September is the time when most of our wood-warbler species migrate through the Fill. Wood-warblers are a family unique to our hemisphere. They are small songbirds (4-7 inches long) that eat mostly insects. North America hosts almost 50 different species each summer. The males of most species molt into bright colors in breeding season so they can attract the drabber females. Much as I love the Fill, this is not the best place to find warblers. At most, we get only 13 species, and some of these are quite rare. So it is always with great delight that I greet the warblers who do come here. One of my favorites, and one of the most colorful of all the species, is the Yellow Warbler, a bird so yellow it resembles a small sun rocketing through galaxies of green leaves as it hunts for food. Two Yellow Warblers were migrating through here yesterday. They both showed up to forage in the bushes lining Main Pond, the biggest pond at the Fill. This pond has many bushes, and each bush has innumerable insects, so there was plenty of food to go around. Evidently, though, this was not the case in the minds of the two warblers, who spent more time chasing each other than they did finding their own bugs to eat. They acted like they had to defend each little branch of each bush from the depredations of their rival. Around and around they would fly, never allowing each other a moment to perch or, God forbid, eat anything. 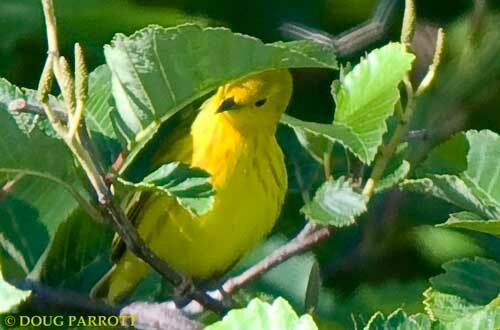 I wonder if those Yellow Warblers will chase each other in continuous spirals all the way down to South America. This entry was posted in Uncategorized on September 10, 2011 by constancesidles.